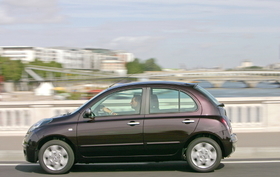 Nissan will replace the current Micra (shown) with a lighter, leaner model. The replacement for the Nissan Micra subcompact will debut at the Geneva auto show on March 2. The so-called Global Compact Car is the first new model developed on Nissan's all new V Platform, which has been designed to minimize weight to help reduce emissions and improve fuel economy. Sales of the new subcompact start in Europe in the autumn following the car's debut in Thailand in April. Production of Micras for the European market will be moved from Sunderland, England, to Renault-Nissan's new factory in Chennai, India. The Juke was created by Nissan Design Europe in London to merge the ruggedness of an SUV with the looks and lines of a sports car. The Juke will be made alongside the Qashqai and Qashqai+2 medium SUVs and the Note minivan at Nissan's Sunderland factory. Nissan's plant in Oppama, Japan, will build the Juke for other global markets, including the U.S. The Juke will go on sale in Japan in the summer, in Europe at the end of September and in North America in the fall. Nissan aims to sell 140,000 to 150,000 Jukes a year with Europe accounting for an estimated 60 percent to 70 percent of the total volume. 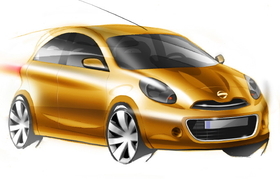 Nissan released this sketch of its future global subcompact that will replace the Micra. In Europe, the Juke will offer three different engines: one diesel and two 1.6-liter gasoline units, all of which are Euro 5 compliant. The top engine is a new 190-hp turbocharged gasoline direct-injection unit. The combination of direct injection with a turbocharger provides the power and responses usually found in a 2.5-liter engine. The 1.6 turbo is available with Nissan's so-called "All-Mode" four-wheel drive system, which has been upgraded to include torque-vectoring technology. As well splitting torque front to rear – up to a maximum of 50:50 – power can now be split from side-to-side across the rear axle too, enhancing agility and reducing understeer when cornering. Until now, torque-vectoring technology has only been available on top-of-the-range premium vehicles. The range-topping version of the new Volvo S60, which also debuts in Geneva, will offer torque vectoring. The Juke is the third member of Nissan's crossover family, which also includes the Qashqai mid-sized crossover and the Murano, the largest of the trio. Nissan has changed the Qashqai's hood, front bumper, fenders, grille and headlamps. The Qashqai, which is built alongside the Juke in the UK, will show off its new face in Geneva. 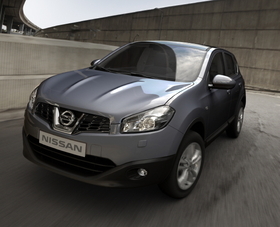 Nissan has changed the Qashqai's hood, front bumper, fenders, grille and headlamps. The larger Qashqai+2 gets the face-lift as well. Along with the exterior changes, Nissan reduced the Qashqai's CO2 emissions. It achieved the reduction by changing the Qashqai's underfloor to optimize airflow and cut down its drag. To further reduce emissions in the new so-called "Eco" version of the crossover, Nissan has given the car more aerodynamic wheel covers, equipped it with tires that have a low rolling resistance and changed the shifting ratio. The changes help drop the Eco Qashqai's CO2 to 129 grams per kilometer from 137g/km. Nissan's stand also will feature the Leaf electric car, which is making its Europe debut. The compact car is the first in a range of electric vehicles due from Nissan and its alliance partner, Renault SA. European deliveries of the Nissan Leaf electric car start in late-2010. The 4445mm-long, 1770mm-wide,1550mm-tall Leaf gets its power from an in-house developed compact, front-mounted electric motor that drives the front wheels. The motor gets its energy from a lithium-ion battery pack mounted under the seats and floor. The motor provides 80 kilowatts of power and 280 newton meters of torque, which is enough for a maximum speed of more than 140 kph (90 mph). The Leaf has a range of approximately 160km (about 100 miles). It takes eight hours to fully charge the Leaf's batteries but just 30 minutes to fill the batteries to 80 percent capacity by plugging into a normal household outlet. 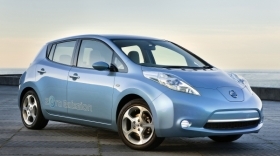 Nissan will start taking orders in Europe for the Leaf in the summer. The first batch of cars, all left-hand-drive models, will start arriving in Europe in late-2010. Also appearing on Nissan's Geneva stand will be updated versions of the Pathfinder SUV and Navara pickup plus the open-air version of the 370Z Roadster. The highlight for the revised off-road models is the addition of the new 3.0-liter V-6 diesel with 238 hp and 550 newton meters of torque. The drop-top version of Nissan's iconic Z car makes its European debut in Geneva. Like the coupe version, the Roadster is powered by Nissan's 3.7-liter 328-hp V-6 engine that can be mated to a manual gearbox or a seven-speed automatic transmission with paddle shifts. The car's roof opens in 20 seconds. Customer deliveries begin in March.